As the title says, Alesha was ever so quite this morning in her bedroom playing whilst the cleaning was being done in the living room. 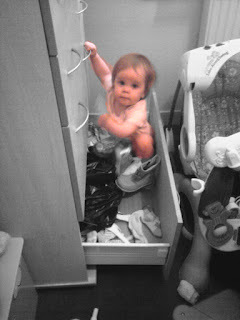 She was just abit to quiet for my liking so daddy went into to see what she was doing and the cheeky little madam had managed to open the bottom drawer that did contain her shoes and socks and decided she wanted to climb into it. Me & Andrew couldn't help but laugh even tho it's not something she should be doing but was very hard to keep a straight face and just take her back out. I suppose that's what we get for wishing everyday for her to walk and run about and now that she is she can get up to anything. It's time I think we invested in eyes for the back of our heads.